Master woodcarver. 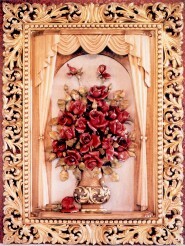 Hand carved wood furniture, staircase, doors, mantles, ornaments, gifts and fixtures. Handcarved items from master woodcarver Eugene Pentz. The wood carvings shown here are a diverse range of hand-carved gift items, decorative architectural pieces & complete custom-made home & office interiors. Selections include frames for paintings & mirrors, jewelry boxes, furniture, staircases, chandeliers, corporate & family crests, vases, bas-relief, door panels, chess sets of varying themes & more expertly crafted works of art. Click here to view one-of-a-kind, custom made perfect for that very special occasion. For builders and architects looking for quality workmanship, the pages listed above showcase furnishings and accessories, as well as exterior carving applications. Click to view the spectacular carving entitled "Everlasting Bouquet"
A custom-made staircase built for a client from West Vancouver, BC, Canada. PLEASE NOTE THAT THE FOLLOWING PAGES WILL SHOWCASE DIFFERENT ITEMS ON A REGULAR BASIS. PLEASE VISIT AGAIN TO VIEW MORE FROM THE STUDIO OF EUGENE J. PENTZ.